A guided tour of some of the key places where the artist spent his time when he lived in Barcelona. The tour explores Picasso’s Barcelona in depth. An expert guide will accompany you through the bohemian Barcelona of Picasso's youth and take you on a tour through the world-famous Museu Picasso. You will receive the Barcelona Cards here for a favourable online price. Booking is really simple: select the product on the upper right and enter the desired number. Select the shipping method (mail or voucher by e-mail). Then click on "Add to cart". Full flexibility: You can choose yourself from when you would like to use the Barcelona Card. Our voucher and tickets are valid the entire calendar year. Starting with the first use the Barcelona Card is valid for 72, 96 or 120 hours. Shipping with the post (4.90 € shipping costs): This allows you to have your Barcelona Cards before your trip to Barcelona. No waiting time to pick them up. You are independent of the opening hours of the issuing offices. Shipping by e-mail (free shipping): Immediately after booking you will receive the voucher, with which you can pick up your booked Barcelona Cards directly at the airport or at several locations in the city area (issuing offices stated on the product page Barcelona Card or on the voucher). This route will take you to such unique places as the Quatre Gats, the beer hall and cabaret on Carrer Montsió, the friezes on the façade of the Col·legi d'Arquitectes, Picasso's only open-air artwork and the Llotja de Mar, the art school where he studied. You'll also walk along carrer Avinyó, a source of inspiration for Picasso from which his famous painting "Les Demoiselles d'Avignon" takes its name. The tour ends with a guided tour of the Museu Picasso, a key museum if you want to understand and find out about the artist's formative years and development. The museum, which is located in the Palau Montcada, houses more than 4,000 works which make up the world's most complete collection dating from Picasso's early years. Picasso spent important times of his artistic life in Barcelona. Many of his works were inspired by the city and you can find places from Barcelona in his paintings again and again. During our Picasso guided tour, we will show you the places where Picasso lived and worked. Afterwards the tour ends with a guided visit of the Picasso Museum, which houses the most important collections of works from Picasso's early years. Here you can book an open Picasso Tour with subsequent visit to the Picasso Museum. With the Barcelona Card you receive many discounts at sights in Barcelona. 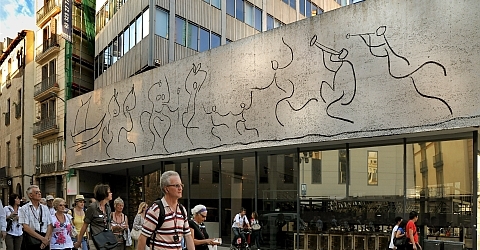 For example 50% discount for the Barcelona Walking Tour Picasso.